If you’re reading this post and this is you – then I’m sorry and I hope it doesn’t trigger you in any way. Many of us, including myself, didn’t get the birth that we wanted – the birth that we had hoped for and visualised – I’d class us as having birth disappointment or birth grief. For others, it’s bigger than that, and they might have not only been disappointment but experienced trauma for whatever reason – if that’s you – then it’s important that you find a way and space to express how you’re feeling so that you can move on. And for others, it might be much more serious – with PTS/PTSD experiencing flashbacks, numbness, hyper-vigilance. I believe that our births are a fundamental cornerstone to how we start our parenting journey. I believe that a good birth allows parents mums and dads to parent in the way that they want. 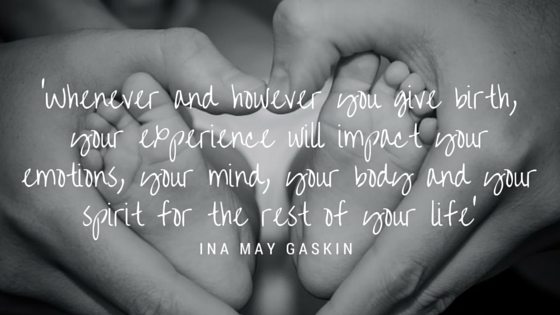 Where birth hasn’t been a positive experience, we have to work a lot harder and the harder our births have been, then the more support we AND our babies need to get to a good place. This never means that we don’t love our babies (although for some mums regardless of the birth they have had may take time to fall in love with their babies – whilst we don’t necessarily like to hear it – it happens a lot – that’s separate from the issue that I’m talking about now). Why do I place the importance on this? Healing from a physically and emotionally difficult birth when we are trying to look after a new baby at the same time, needs support. How can you look after a new baby when you need to look after yourself. It’s vital that you have good quality support around you to help you come to terms with what’s happened to you – and not just for you but your birth partner. I’ve seen too many mums, fragile post birth, trying to work out what on earth they have been through whilst also coping with the normal demands of a baby. A baby who has also had a challenging birth may need support too to let them know that they are safe – birth can have a profound affect on a baby (often mistaken for being colicky or refluxy when actually they are stressed and need extra support too). Birth trauma/PTSD or birth grief all increase our susceptibility to postnatal depression with PTSD being very much identified in it’s own right as part of the Perinatal Mental Health spectrum. Art can be another very therapeutic form – even if you’re not an artist or can’t draw – drawing anything that comes to mind can be helpful too – maybe drawing how you wanted the birth to be or how it was. Again, no one ever needs to see it or analyse it. I found it really useful and I can’t draw anything more than stick men…. Go along to your nearest Positive Birth Movement Group. I hope that’s helpful. I think often when we’ve had an experience that we didn’t expect, we have this massive amount of baggage to deal with and don’t feel like we can do anything with it. I hope the above can help you to see that actually you can now do a lot to help you to process what’s happened to you. Whilst the memory of having a traumatic birth may still reside in you, these tools and techniques can help to reduce the impact that these may have.